Longevity of seals is not just about the seal itself, but also about specifying the optimal mating surface finish. There is a direct relationship between the quality of a seal’s mating surface finish and a seal’s performance—the better the finish, the longer the seal will last. In fact, an optimal surface finish can deliver a competitive advantage in seal longevity and performance. In contrast, aggressive seal wear from a poor finish on the mating surface can lead to seal failure. 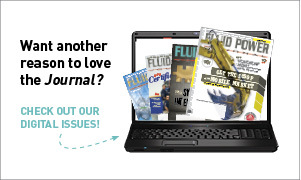 For instance, in a fluid power application, seal finish can influence how successfully the fluid is contained within a system, ultimately affecting both seal and system life. This is just one example of why it is so important to focus on both the seal and the mating surface specification. But what key parameters, testing, preparations, and methods of finishing should be identified and why? The good news is there’s a wealth of information available on optimizing surface finishes, including methods for roughness testing and recommendations based on those tests. Simply understanding a mating surface’s Ra, or roughness average value, is not enough to properly specify the surface finish because it is entirely possible to have very different surface textures with similar Ra values, and those variances can greatly affect seal performance. For example, valleys are needed on a surface to build up sufficient fluid film to reduce friction and wear, but a high concentration of peaks, also known as open profiles, can cause excessive wear. Therefore, the ideal surface contains low valleys without high peaks (see Figures 1 and 2). Note that both of these surfaces have an Ra value of 2.5. Rz refers to the average of the tallest peak to the depth of the lowest valley from each subsection of a surface measurement. In measuring roughness, Rz offers an advantage over parameters such as Rt, which is the height of the single tallest peak to the depth of the deepest valley in a surface trace, because it incorporates more of the surface. However, Rz is an average of only the most extreme instances of surface roughness. So it has the potential to be overly affected by outliers, which take the form of sharp peaks on the surface. The presence of outliers can unfavorably affect quality-control efforts, as well as practical analyses for the discernment and correlation of surfaces. In addition, surface roughness may be overly influenced by valley depth, which is considered less detrimental to performance than peak height. Reducing outliers can help in delivering a more robust curve and surface fitting. For example, Figure 3 shows an instance where the Rz value is the same between two surfaces, but the profiles are very different. This demonstrates why the profile’s bearing ratio, Tp or Rmr, is also critical for determining surface quality. Rsk classifies the magnitude and direction of surface roughness. Positive numbers represent surfaces consisting predominately of peak asperities or harsh qualities. Negative numbers represent surfaces that consist primarily of valleys. 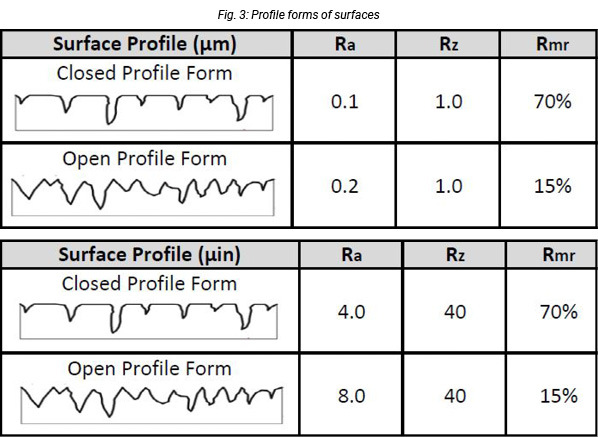 Rsk is an excellent parameter for measuring surfaces expected to have peaks or valleys. However, if a surface has been largely planarized and few peaks or valleys remain, Rsk returns to nearly zero. In this situation, Rsk could inaccurately suggest that a surface with higher roughness is superior to a surface with lower roughness. Thus, Rsk on its own is not descriptive enough to differentiate between rough and smooth surfaces. Surface roughness can be measured using a profilometer. This can either be a contact type, where a stylus measures surface roughness with the results depending on the stylus and scan length, or a non-contact type that uses white-light interferometry to characterize the surface topography in 2D or 3D. Defining the surface topography with a noncontact profilometer is the preferred method of testing; however, contact profilometry is more commonly used in the industry due to its lower cost. 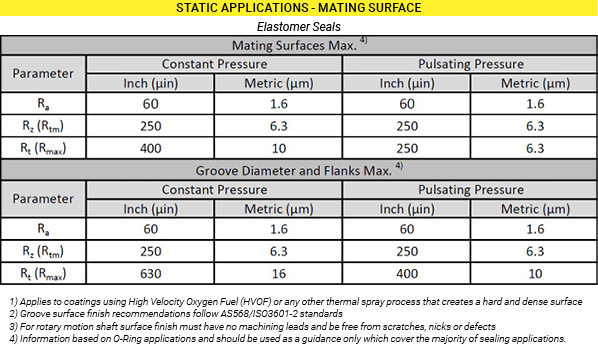 The tables on this page contain recommendations for choosing mating surfaces for a variety of seal types within linear, rotary, and static applications. Notice that dynamic linear and rotary applications require a better surface finish than static applications. Also, elastomer and polyurethane seals can operate against a rougher finish than polytetrafluoroethylene-based (PTFE) seals. 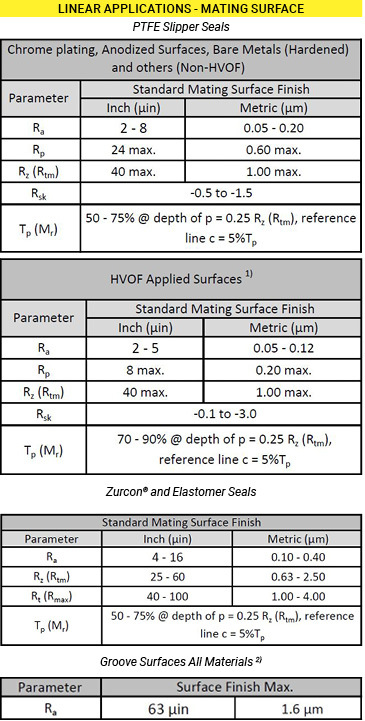 It is critical to take both the dynamic operation of the seal and its material into account when specifying contact surface finish values. Slipper seals run well against un-plated surfaces at moderate speeds and pressures. In high-speed and high-pressure reciprocating applications, harder surfaces are recommended. This is because a seal will polish its mating surface, especially when made of softer metals, during the run-in period. The run-in period is the initial time frame of high wear and friction, where the seal begins to polish the mating surface by breaking off the peaks. Once the peaks are broken off and the hardware and seal reach an equilibrium state, the run-in period ends. For example, after the run-in period, a reciprocating rod of stainless steel with a hardness of 28 to 30 Rockwell C and a 25µin / 0.635µm Ra surface will typically be polished by the seal to 12µin / 0.30µm Ra or better. Seal friction and wear will decrease accordingly after the run-in period. Therefore, it is important to reduce the run-in period by precisely controlling the surface profile, especially on harder mating surfaces. In applications where the mating surface is plated or coated, the hardware material is still considered critical. If the plating is supported by a soft substrate, it may crack or carve-in under a high pressure load due to insufficient support. The plating could also crack if it does not meet the suggested thickness. Proper hardening of the substrate material, along with proper coating thicknesses, will ensure the dynamic running surface is not damaged. There are a variety of surface finishing methods for use on fluid-power components, including plunge and centerless grinding, turning, lapping, honing, roller burnishing, and polishing. However, most sealing surfaces are ground and polished. Hand polishing usually results in inconsistent finishes across the work piece and should only be used when absolutely necessary. Generally speaking, super finishing imparts a more consistent polished surface. This process involves applying an abrasive paper or other abrasive media via machine to polish a surface. The operator can tune the process by adjusting the scale or grit of the abrasive or by changing the feed speed. Consideration of the surface finish that mates against a seal is essential to ensuring a leak-free sealing system with a long life in fluid power applications. 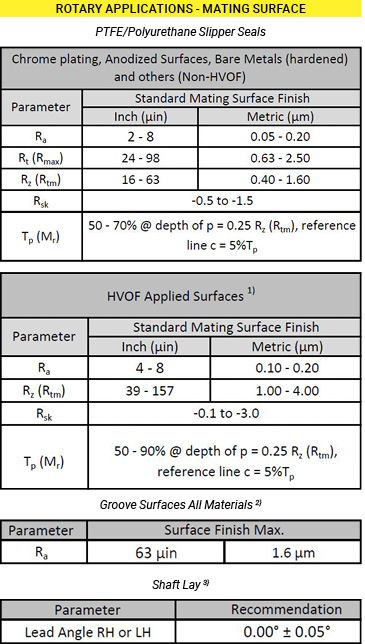 Step one in selecting the optimal surface finish for a particular sealing system is understanding a surface’s Ra value, but this does not tell the whole story. Rather, a number of finish parameters, including maximum profile peak height, mean roughness depth, profile bearing ratio, the degree of skew, and the total height of the roughness profile should be taken into account. Finally, it’s important that both mating surface preparation and finishing methods be considered during the selection process. Working with a seal supplier that has expertise in supporting the specification of mating surfaces can ensure that fluid power application and system lives are maximized.